Honda, Yamaha and BMW have sold plenty of 1300cc sport touring bikes over the last 10 years. With thousands of satisfied heavy weight sport touring enthusiasts, you'd think the market would be satisfied. But there's another group of riders who would prefer a lighter weight bike that's just as capable of carrying all the gear and providing as much fun as the big boys. To some extent those bikes have been around, but more likely branded as street standards requiring some modifications to get them up to sport touring standards. Above: Kawasaki's new Versys 1000 LT. Can you see yourself touring on this mount? With recent model offerings, the middle weight sport touring market is more obvious than ever before. Before we look at current model offerings, it should be noted that a 250-400cc street standard, regardless of what modifications you make, isn't all that fun morphed into a sport touring bike. With the lower horsepower and lighter weight, the gumption to carry a heavy load, accelerate and handle well in the corners simply does not exist. If your plan is to convert a lighter weight, lower cc'd machine into a light weight sport touring mount, think again. We'd qualify any 600-1000cc street standard, or purpose built sport touring model into the middle-weight category. So let's have a look at what the manufacturers are offering that a rider might enjoy. F800 series bikes - BMW has been making the F800 series of bikes since 2006. Over time they have offered an S, R and ST model, all worthy of being sport touring road scholars. Simply add the OEM offered luggage, or get third party gear and you're pretty much set, as the ergonomics are already there to suit most rider builds. NC700X - Most of the time, you'll see these running around naked, but the OEM luggage is the cat's meow when it comes to maximum storage. Designed by Givi, the saddle bags and top box provide 100 liters and the storage compartment in the typical tank position offers another 20 liters. 120 liters of hard storage on a bike is unheard of across virtually any manufacturer, let alone in the middle weight category. There's enough room around the rims to outfit the bike with a TKC80 on the front and a Heideneau scout on the rear for better tread wear and the occasional off-pavement diversion. Where the bike falls short is in the suspension category which offers no option on the front and only preload on the rear. But for such a low shelf price, you can use the leftover money in the bank to upgrade the suspension and add the luggage. A custom seat makes a difference for most as well. Versys 650 & 1000 - One of the beauties of the Versys model is its attention to suspension. In the middle weight category, that's typically overlooked and riders need to get into after-market mode to amp up the suspenders. Both classes feature rebound and pre-load adjustments at both the front and rear, with inverted forks at the front. Without being wrapped in luggage it doesn't look like much of a sport touring bike, but once it's cloaked you can see it's ready to take on multi-day travel. In 2015, Kawasaki upped the ante offering the Versys 1000 LT model with OEM luggage. While some riders will use it for the occasional fire road diversion as well, those 17 inch rims aren't the best in the gnarly stuff. V-Strom 650-1000 - Yeah, sure, a lot of dual sport riders profess to this bike's abilities off-pavement, but seriously, with those three point cast rims, it's not the best suited for that. However, when it comes to sport touring, Suzuki's V-Stroms provide an affordable option with all the gumption that has stood the test of time for a decade now. And there are many luggage options from both Suzuki as well as after-market companies including Happy Trails, Touratech and Twisted Throttle. 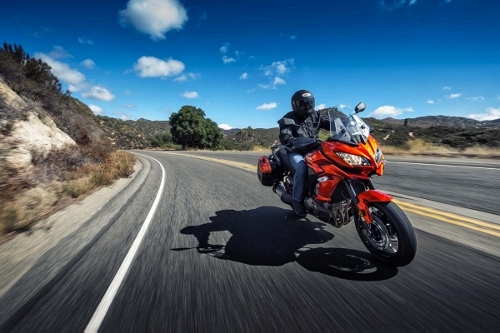 Tiger 800 series - Have you stopped lately to realize how many models Triumph is offering these days? Lots. At the 800 level the Tiger is available in 4 models including two dual sport specific bikes and two standard models, which can all easily take on hard or soft luggage and serve the sport touring purpose very well. OEM metal hard box options are available for the tail and saddle bag regions, or see what you can dig up third-party-wise where the offerings are growing each day. FZ series/FJ-09 - While the FZ-6 and FZ-1 models were sold as street standards, or naked bikes, with a little ingenuity you could easily turn one of these models into a trusted middle weight sport touring steed, and many a rider did so using soft luggage options, bar risers, seat and suspension modifications. This works well for the newer FZ-7, which sports the lighter parallel twin powerhouse, rather than an in-line four motor. But it's Yamaha's new triple cylinder 900 cc powerhouse has been slipped into an official sport touring model by way of its latest offering, the FJ-09. While the luggage is an accessory, don't pass it up. The center stand is standard, as is the 15mm main seat adjustment for taller riders. Long range touring on middle weight bikes is an awesome experience. If you're looking to upgrade, one or more of these wonders is calling you.